There's a Card for That: CAS Hello Baby | ft. MFT's "Magical Dragons"
I know that I have been doing a lot of birthday cards lately, so today I thought I would show you a clean and simple baby card that I created for a friend of mine. We're not entirely sure what she's having so I went with sweet gender neutral tones, and the dragons from My Favorite Things' "Magical Dragons" stamp set are just perfect. To begin, I stamped the little dragon with Memento Tuxedo Black ink on 110lb Copic-friendly cardstock, I then masked off his face and stamped the larger dragon. I didn't want a huge amount of overlap, and with these two, I found an almost tenderness to their interaction that worked out perfectly for this card. I coloured both the images in with Copic Markers. I stamped a greeting from CTMH with the Memento ink as well. I matted the panel with a soft purple cardstock and then adhered the entire piece to a standard A2 sized card base. Finally I added a scattering of coordinating enamel dots to finish off the card. I hope you like today's card and are inspired to create something of your own. If you haven't all ready, please follow me over on the right side bar, if you are viewing this via mobile device scroll to the bottom and click "View Web Version" first, you can also follow me over on Facebook. Toss me a line in the comments section below and let me know what you think. Awww such cute dragons, and I love the colours you've used - beautiful card! So cute. Love the colours. Beautiful colouring too. And love your name too. 😉 Trina P.
sooo cute the little dragons!lovely coloring! This is adorable - your colouring is gorgeous! 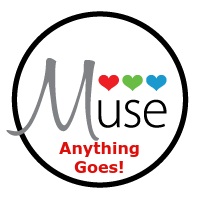 So glad you joined us at our Anything Goes week at Muse! How cute. Love it. Gorjuss colours.